Coconut oil has been my new “thing” this month, and I must say that I've quickly become a fan of it. I heard about its many wonders before from others and decided to finally give it a try myself. Although people make different use of it, I've been mainly using mine as a deep conditioner treatment for my curls (as I've noticed that they've lost that oomph.) With my current hectic schedule I've been somewhat negligent with my proper hair moisture routine and I need to get back on it. Coconut Oil is really good for your hair as well! You put a little bit, and it goes a long way. Yes, I've starting using it for my hair. I'm hoping it will revitalize it back to "normal." I've really wanted to find some coconut oil after trying coconut milk spray from Organix which I really love! I didn't think of trader joes, so thanks so much for sharing! Let me know what you think of it should you decide to try it. I love coconut oil! It has so many benefits, some people even brush their teeth with it (seriously!) I made DIY mask with coconut oil :) they're so fun to do and perfect for my super dry skin! Great post! Speaking of dry skin, I also slather some on my legs right before shaving to keep them moisturized. Who knew this one product had all these wonderful perks! 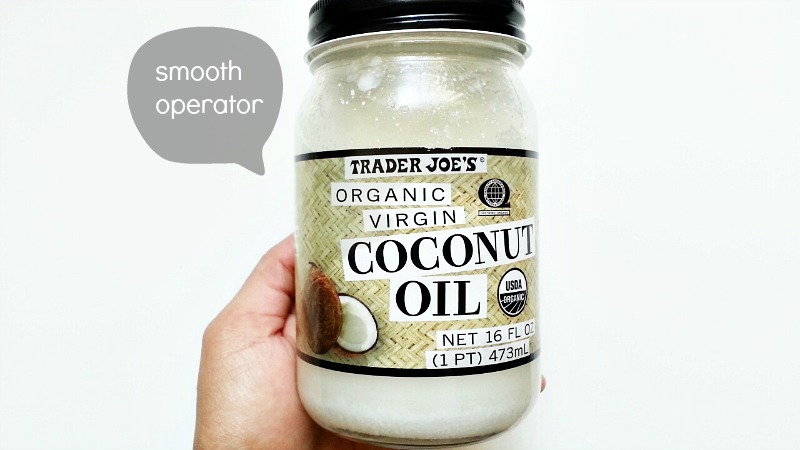 I use coconut oil on my hair after showering - it's so brilliant for smoothing the cuticles and making them shine. I use it for the smell more than anything though, yum! Cuticles..now there's an idea!! Thank you for sharing.